Sunday, when Canadian Prime Minister Stephen Harper held his final press conference of back-to-back G-8 and G-20 summits, reporters asked him the same questions that for three days had circulated at the international media center in Toronto. Is there a continued need for dual summit meetings? And if so, what is their interrelationship? Harper spoke about the differences between both and the role the G-8 would continue to play. But it seems clear that the expanded Group of 20 nations is already overshadowing the Group of Eight in many respects. 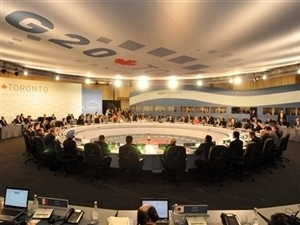 Over four successive summits since 2008, the G-20—which includes China, India, and other growing economies— has effectively helped avert economic Armageddon. At last year’s Pittsburgh summit, the group dubbed itself “the premier forum for our international economic cooperation.” This past weekend, the G-20 took the lead on global economic recovery, financial regulation and reform of international financial institutions. It’s clear that rising powers have an important role to play in addressing the increasingly interconnected nature of the world’s most pressing transnational challenges. What’s not yet clear is how seriously the G-20 will embrace the development agenda that has held a central place in G-8 meetings over the past decade.. The answer could determine the fate of countless families and individuals in the world’s most marginalized communities. That in turn will determine just how balanced and sustainable we all can expect future economic growth to be. Save the Children went to Toronto with a vital message for the G-20 as it takes the economic reins from the G-8. This more inclusive group of world leaders must urgently assume greater responsibility in addressing the extreme poverty ravaging large swaths of the developing world. It would be the height of irony if including emerging countries in global economic leadership comes to mean the world’s poorest people are effectively left off the international agenda. The signs of what’s to come were mixed in Toronto this weekend. In its communiqué, the G-20 offered encouraging language on “narrowing the development gap,” and it reaffirmed last year’s G-8-led food security initiative, which the G-20 had endorsed in Pittsburgh last September with moderate contributions. But the group declined to expand its development mandate beyond the positive step of establishing a working group. Unfortunately, the G-20 did not seize the perfect opportunity for decisive action on development that this weekend’s back-to-back summits offered. The group could have backed the G-8’s new maternal and child health initiative, freshly declared at Muskoka, but it did not. . The G-8’s proposed investment of $5 billion over five years fell short of what is needed to dramatically reduce the 9 million child deaths and 350,000 maternal deaths each year. The G-20 could have helped close that gap. Throughout much of the developing world, diseases like pneumonia, diarrhea and malaria and complications at birth continue to kill and disable large numbers of mothers and children, although the proven, cost-effective solutions are well-known. The Muskoka initiative did mark a step in the right direction by galvanizing some international action to address maternal and child health. That’s not only the right thing to do, it’s the smart thing to do. One need only look at how attention to child and maternal health, and the smaller family sizes that followed, helped fuel southeast Asia’s dramatic economic growth in recent decades. Global progress depends on G-20 leaders improving maternal and child health within their own societies and providing global support for the related U.N. Millennium Development Goals. Of eight universally adopted goals, those on maternal and child health have seen the least progress toward 2015 targets. All nations – with the G-8 and G-20 in the lead – must commit to game-changing action at a special U.N. summit in September. As G-8 and G-20 leaders determine their future roles, they will ultimately be judged on how effectively they address the world’s most pressing problems. The G-20 may now be the best and most inclusive international forum for leaders to choose among competing priorities and catalyze global action. As such, the G-20 must expand its economic mandate to address the needs of the world’s poorest people.